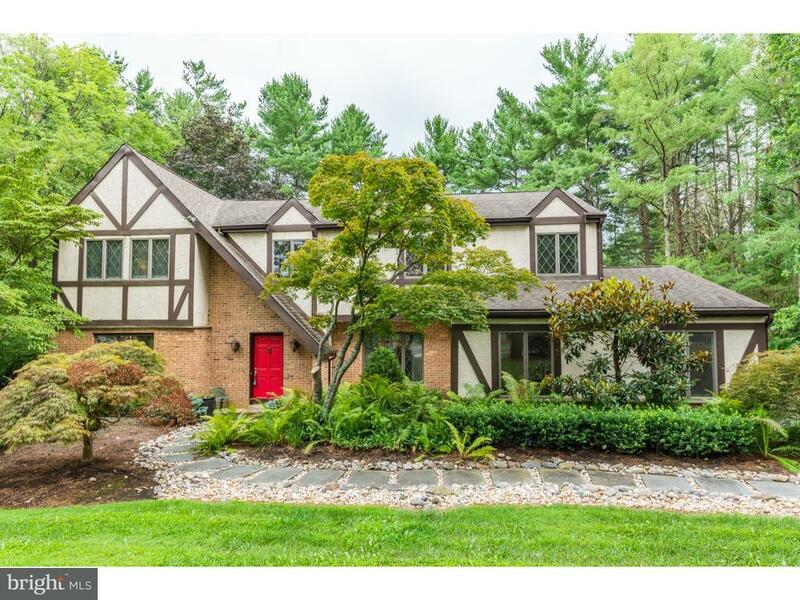 Wonderful opportunity to own a Tudor style/Colonial home in the highly desirable Hickory Estates on over 1 acre+/- in the heart of Plymouth Meeting. Enter into two-story foyer with natural light. Offset Living Room (brick fireplace and mantel) & formal dining rooms w hardwood floors & grand wood trim moldings. Large Eat in kitchen (21x13) with breakfast area w window seat, also has abundant cabinetry, pantry & large island. Convenient laundry/Mud room near garage and yard. Tucked away powder room on this level.Cozy room (20x15) with raised hearth brick fireplace, chair rail and subdued beamed ceilings. Retreat to the large wood deck at the rear (38x16)- Enjoy the large, private backyard offering wonderful views in a supreme level landscaped setting. Three car garage (30x20) with plenty of private parking in the driveway. UPPER Level: Four Large bedrooms each w lots of natural light. Master bed has sitting area towards front, master bath with built-in shower, soaking tub & dressing area (7x6)/ seperate sinks, large walk in closet (10x7). On the LOWER Level: find a surpringly large, fully finished basement with a nice Rec room (24x22), In-Law suite Bed & Full bathroom (16x9), Game Rm (26x12), seperated wine cellar (9x7)w controlled temp exhaust fans, plus util area. Huge flat wooded lot with a park like setting ? rare size over an acre. Colonial School District - Within one mile of 476 and the Pa. Turnpike. Close to parks, Conshohocken, Ambler and a few minutes from the Turnpike, NE Extension, and the Blue Route, Whole Foods, Two Great Movie Theaters, many fantastic restaurants, and plenty of shopping at the Plymouth Meeting Mall and the many stores on Chemical Road plus located in the award winning Colonial School District. Set your appointment today!